The Tent is one helluva ride! I read it in one sitting. Old man McCabe is in a secluded cabin when his dog begins to bark and whine. Tension rises, so McCabe goes looking to see what the dog is barking at. McCabe finds an abandoned camp with a tent. Mike tries to bring his family closer together with a camping trip to Hocking Hills, Ohio. What Mike doesn’t realize is that they aren’t prepared for camping. A storm hits, which causes their tent to blow away. Emma (the bitchy wife) chides Mike for buying the cheap Wal-Mart tent. They lose their son in the wilderness during the storm. In the end, they find another tent with a light glowing inside. Kealan Patrick Burke has done it again! The author does a great job of setting the tension from the start and slowly building that tension as the story progresses. The characters are relatable. I felt sorry for Emma and Mike because of their crumbling relationship. That ending was crazy! If I’m being honest, I will never go camping in Hocking Hills, Ohio! 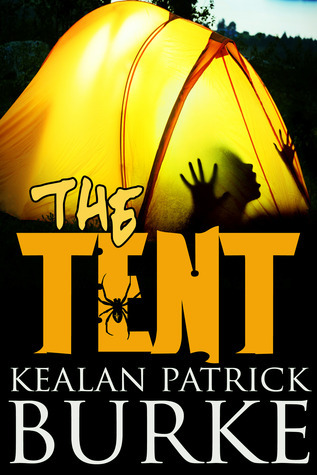 I highly recommend this book to fans of horror and camping!